Apple iPad Mini black touch screen with IC chip and Home button, this is the complete assembly you require for a simple home repair without any soldering. If you have damaged the front glass on your iPad Mini and it has cracked, or if the touch screen is not responding to any input this spare part will get you back up and running again. 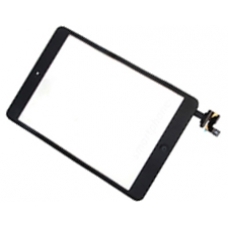 This complete black iPad Mini touch screen with IC chip and Home button replacement part does not require any soldering, installation is simple and involves attaching the new screen and connection of the push fit connector.